Click to customize this invitation. If you are hosting a makeup party, you'll want to let your guest know that they're invited using a cute, appropriately themed invitation. This is true whether you're holding a direct sales party where a representative will do makeovers and sell makeup or if you are hosting a fun grown-up girls' night or a get-together for young ladies who love playing with makeup. The printable invitations provided here are cute and colorful, making them a great choice to put your friends on notice that you're holding a makeup party. The first invitation above is a general one that can be used for either type of makeup party just by tweaking the wording a bit. The ones below are each specific to a particular type of makeup party -- a sales party and a birthday party. Choose the invitation design that best meets your needs and click on the image to download a customizable PDF. If you need assistance with the documents, see this guide to Adobe printables. Click anywhere in the file to add details about your party. 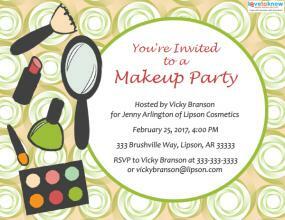 Be sure that the invitation clearly states whether people are being invited to a shopping-oriented makeup party (include the company name and representative name) or just to socialize. When you are finished, use the menu commands to save and print. These invitations will print as 11" X 8 1/2" flyers. You can print them on standard paper or card stock. They will look best printed using a color printer. If you do opt for black-and-white-printing, consider using pastel colored paper to give them a bit of "pop." If these invitations don't quite meet your needs, there are some other resources you may want to consider. Day of grown-up pampering: Expressions Paperie has a really cute 'day of pampering' themed invitation that is perfect for a gathering of grown-up girls whether sales are involved or if the get-together is strictly for fun. The images show girls having fun in various stages of pampering, from a pre-makeup facial masque to full makeup paired with hair curlers. Customize each line of text. Order a pack of 10 printed invitations for $13.50 up to a set of 100 for $135. Alternately, you can purchase a digital printable invitation for $15 and do your own printing. Gathering of girls (any age): Also from Expressions Paperie, this super-cute makeup party invitation would work just as well for a party for kids and tweens as it would for teenagers or adults. The invitation features images of lipstick, eye shadow, and a makeup brush across the top, above several lines of text that you can fully customize to include specific details about your event. Pricing is identical to that of the 'day of pampering' invitations. Both printed and digital options are available. 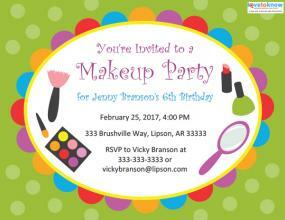 Birthday makeup party: If you're hosting a makeup party for a young lady, this great invitation from seller LittlebeaneBoutique on Etsy is a terrific option to consider. Text is fully customizable and the graphic elements include lipstick, eye shadow, nail polish and a bold polka dot pattern. There minimum order is 15 invitations, and they cost $1.69 each. Return address labels are included. Once you've chosen the right invitation, be sure to send them out far enough in advance of the party so that your guests won't have schedule conflicts. Everyone is sure to be thrilled to receive an invitation to such a fun event. Who knows? 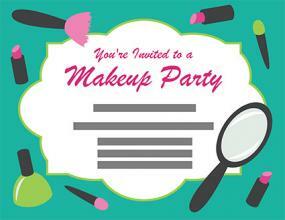 Your makeup party might be such a hit that you'll be ready to move on to a purse party next!